Navigating the market for used work boats for sale can be a difficult and time-consuming exercise without professional help. That’s why it is important to consider a commercial vessel broker or brokerage service to best help you find the right used commercial fishing boats, deck barges, lobster trawlers, schooners, tugboats, and even passenger ships. Continue reading to learn more about the benefits of using a used commercial vessel broker or if you are ready to browse a global network of used work boats for sale then continue to our site. What Are Commercial Boat Brokers? Commercial vessel brokers and international brokerage services use resources from around the globe to help their customers purchase and sell used ships. Commercial boat brokers use agents to investigate international used boat listings and find reputable sellers who they match with potential buyers in every corner of the world. These well-established networks are outside the reach of the common customer looking for used work boats for sale. A used vessel broker can also help you during the purchasing process which is based on an auction system. The market for used boats for sale extends to every continent in the world. A single potential buyer has no way to scour every global listing to find the perfect used boat for sale. Commercial boat brokers can use their experience and expertise to find the right used vessel for any buyer’s needs. They can organize listings based on a variety of details based on what the buyer needs most in the most efficient way possible. The intricacies of the global used vessel marketplace is easily understood making the process of buying and selling easy no matter where in the world a buyer and seller may be. There are many potential pitfalls that can arise when looking for used work boats for sale, particularly in the global marketplace. Foreign legalities, shady sellers, and dishonesty can all act as obstructions which can make finding the right used vessels for sale very difficult, time-consuming, and costly. Commercial vessel brokerage services and their brokers are experienced at legal documentation and processes in every corner of the globe. This expertise ensures that buyers can have peace of mind concerning the accuracy of a listing and a seller. The international network of contacts a ship broker or brokerage service has access to is vast and they can draw on this pool to save the buyer the most time and money possible. 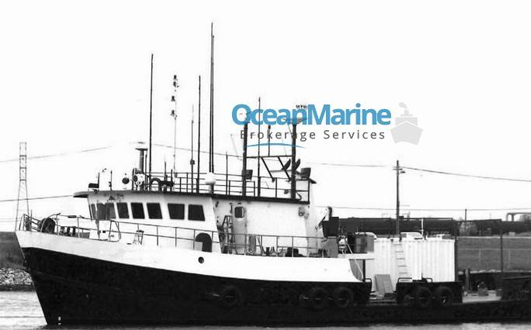 Ocean Marine Brokerage Services has been the premier used ship brokerage service since 1978 with offices located in the U.S. Gulf. Our agents are located throughout the United States and are professionals of the highest integrity. This integrity derives directly from the proud U.S. Coast Guard history many of our employees share. Ocean Marines’ professionalism will ensure that whether you are a buyer or a seller the international market for used work boats for sale is open to you with Ocean Marine.